GenoPro offers a mechanism to store your .gno files to an external storage such as saving files to your private website with an SQL database. How do I use the External Storage? The External Storage is as simple as saving to disk. Instead of using Save As, just select Save to Database. Until GenoPro Gamma is officially released, you need to download and install http://www.genopro.com/download/InstallGenoProExternalStorage.exe to use the External Storage feature. You will then see the following dialog. Just enter the filename and click on the Save button. GenoPro will take care of the rest, by uploading the content of your document to the server. How does External Storage works? By default, the URL for external storage is https://www.genopro.com/sdk/External-Storage/GenoProStorage.asmx, however you can specify your own. To change the URL, just visit the Options dialog from the Tools menu. The URL must respond (handle) the four methods, FilesList, FileOpen, FileSave and FileDelete. 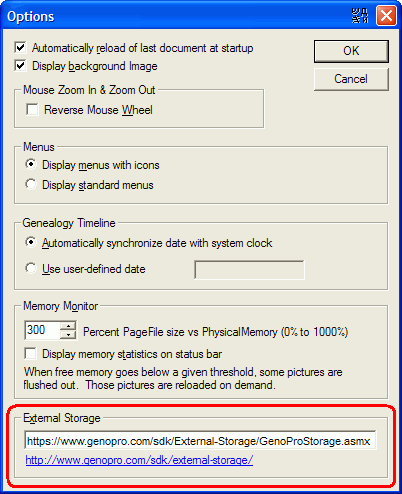 To get started, just copy & paste the code below as file GenoProStorage.asmx and you will have a file-based external storage on your web server, identical to http://www.genopro.com/sdk/External-Storage/GenoProStorage.asmx. You are welcome to customize this code to store the files into an SQL database or some other type of storage. * files into a third-party external storage. * behaviour as the page http://www.genopro.com/sdk/External-Storage/GenoProStorage.asmx. * appropriate web method when necessary. * method FilesList would consist of a "SELECT * from MyDatabase". * comment and/or selling this code for profit. * You are welcome to copy, modify, and distribute this code as you wish. /// This class represents a GenoPro file from the storage system. public string ID; 	            // Unique identifier of a file. It can be anything, including accents and punctuation, as long as it is unique. public DateTime DateCreated;      // Date when the file was first created (in GMT format). public DateTime DateLastModified; // Date when the file was last modified (in GMT format). 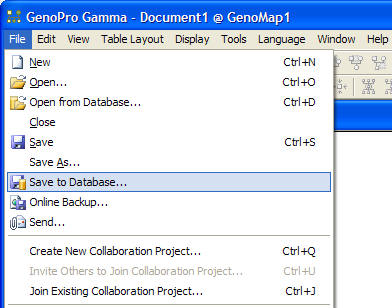 // Add your own fields here and GenoPro will display them in the dialog for opening a file from the database. // For the simplicity, we simply return all files ending with .gno. // You are welcome to write the code to connect to an SQL database and fill in the array of file info. // Add your extra fields here, with real values!!! /// Open a GenoPro file from the storage system, by returning an UTF-8 string. /// Save/update a GenoPro file into the storage system with the UTF-8 content of the file. // In this implementation, the file identifier is the filename, however it could be an identifier assigned by the database. // In our implementation, we write the content of the GenoPro file on disk as a text file. // You could store the file content into a database as an UTF-8 string or a BLOB. // Return the identifier of the file to acknowledge the file was saved successfully. // If the file was created, GenoPro will use this identifier for subsequent saves. /// Returns the directory where the .gno file are stored. /// you are welcome to hardcode the directory to @"C:\MyGenoProFiles\" or something else. public string ID;         // Unique identifier of the GenoPro file. This ID is used for opening, saving and deleting files. public string FileName;   // Friendly name of the GenoPro file stored on the external storage. This name is displayed to the user. public string Error;      // Error code (if any). GenoPro will display this error to the user.